She pricked his bubble with a flat no. にべもなく断わって彼女は彼の野望を砕いた. He lost everything in the Florida real‐estate bubble. フロリダの不動産バブルで彼はすべてを失った. The economic bubble has burst. あぶく経済がはじけた. A pot of stew was bubbling on the range. シチューのなべがレンジの上で沸騰していた. Clear water bubbled up from among the rocks. 岩の間から清水がふつふつとわいていた. The water is bubbling in the kettle. Partly imitative, also influenced by burble. Compare Middle Dutch bobbe (“bubble”) > Dutch bubbel (“bubble”), Low German bubbel (“bubble”), Danish boble (“bubble”), Swedish bubbla (“bubble”). (economics) A period of intense speculation in a market, causing prices to rise quickly to irrational levels as the metaphorical bubble expands, and then fall even more quickly as the bubble bursts (eg the South Sea Bubble). 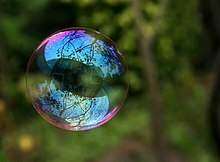 (obsolete) Someone who has been ‘bubbled’ or fooled; a dupe. Granny's a cheat, and I'm a bubble. For no woman, sure, will plead the passion of love for an excuse. This would be to own herself the mere tool and bubble of the man. (figuratively) The emotional and/or physical atmosphere in which the subject is immersed; circumstances, ambience. He’s wrapped up snugly in a cozy bubble of self-regard, talking for his own sake more than anyone else’s. Thomas, so often West Brom's most positive attacker down their left side and up against Salgado, twice almost burst the bubble of excitement around the ground but he had two efforts superbly saved by Robinson. Then a soldier […] / Seeking the bubble reputation / Even in the cannon's mouth. (Cockney rhyming slang) A laugh (also: bubble bath). (computing) Any of the small magnetized areas that make up bubble memory. Many players tend to play timidly (not play many hands) around the bubble, to keep their chips and last longer in the game. (intransitive) To produce bubbles, to rise up in bubbles (such as in foods cooking または liquids boiling). (intransitive, figuratively) To churn or foment, as if wishing to rise to the surface. (intransitive, figuratively) To rise through a medium or system, similar to the way that bubbles rise in liquid. (transitive, archaic) To cheat, delude. She has bubbled him out of his youth. The great Locke, who was seldom outwitted by false sounds, was nevertheless bubbled here. (intransitive, Scotland and Northern England) To cry, weep. For quotations of use of this term, see Citations:bubble.